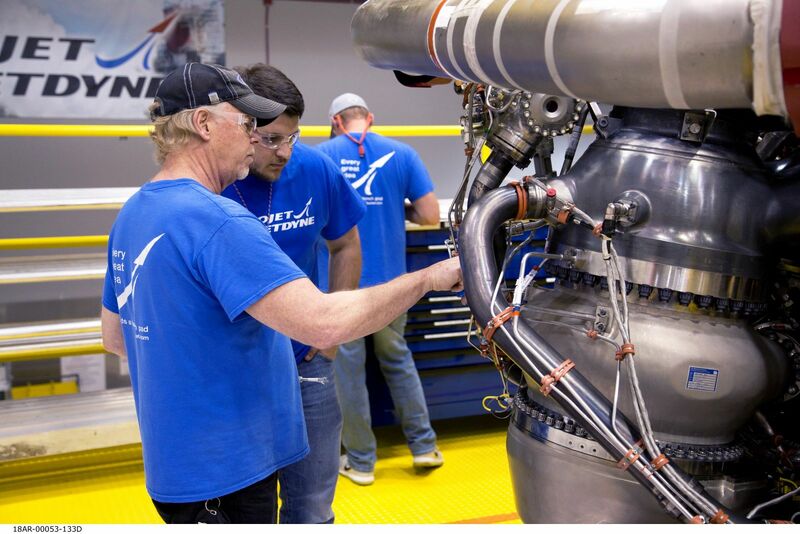 Boeing’s Phantom Express had its AR-22 rocket engine put through its paces over the course of more than a week via tests to ensure the engine’s ability to accomplish the space plane’s objectives. It is hoped these tests will pave the way for the spacecraft to carry out missions to space with a pace similar to that aircraft currently carry out today. Aerojet Rocketdyne conducted some 10 tests of the engine over the course of 10 days ( from June 26 through July 6, 2018) at NASA’s Stennis Space Center located in Mississippi. The location of the test reflects just one of the partnerships that have formed to develop the Phantom Express space plane. The U.S. Defense Advanced Research Projects Agency (DARPA) as well as aerospace giant Boeing are the primary customer and contractor involved in the production of the spacecraft with Boeing both designing and developing the Phantom Express space plane. The project hearkens back to the era when NASA’s fleet of space shuttles were used to send an array of payloads to orbit. “With the AR-22 we are taking reusability to the next level and have demonstrated that daily, affordable access to space is within reach,” said Eileen Drake, Aerojet Rocketdyne CEO and president via a company-issued release. The AR-22 engine is fueled with a mixture of liquid-oxygen and hydrogen is described by Aerojet Rocketdyne as being capable of unleashing an estimated 375,000 pounds of thrust. The pace of these tests was enabled by technicians, who review the data and then carry out inspections of the engine to insure it was ready for to be activated again. Similarly to how NASA’s retired fleet of shuttle orbiters carried out their missions, Phantom Express would be launched vertically and then conduct landings horizontally on a runway. The vehicle’s second stage is planned to be expendable and would be able to deliver an estimated 3,000 pounds (1,361 kilograms) worth of payload to LEO. Phantom Express, was formerly known as the XS-1, and is being developed in order to field smaller satellites for the U.S. military. It is hoped that the space plane can carry out flights daily. These tests have demonstrated that, at least in terms of its engine, the Phantom Express might be one step closer to accomplishing that objective. The AR-22 engine is based off of legacy hardware, in this case the Space Shuttle Main Engine or SSME. It was announced that Aerojet Rocketdyne had been awarded the contract to produce the engine in May of last year (2017). Parts from the SSME from both Aerojet Rocketdyne’s and NASA’s supplies were used to produce two of the AR-22 engines.